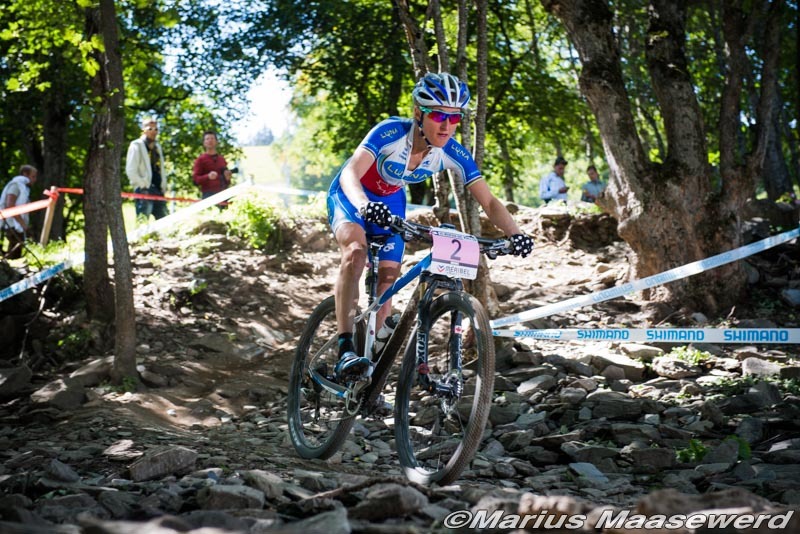 The 2014 Mountain Bike World Cup concluded on Sunday with the seventh and final round of the Cross-country series in Méribel, France. There were no surprises in the overall titles, since Jolanda Neff (Liv Pro XC) had won the women's title prior to the final round and Julien Absalon (BMC) had done close to the same for the men. However, any World Cup victory is important, and Neff took her third win of the season while world champion Nino Schurter (Scott-Odlo) took his fourth. Canadian women's champion Catharine Pendrel (Luna) took fourth in the final round,to ensure her second place in the overall standings, while Emily Batty (Trek Factory Racing) was sixth, also making the overall podium in fourth place. In Méribel the riders were faced with both steep climbs at altitude and technically difficult descents, demanding both skill and fitness to do well. Neff ended her World Cup season the way she began it, with a start to finish ride at the front of the race. By the end of the first lap in the six lap race Neff had 28 seconds on Gunn-Rita Dahle Flesjaa (Multivan Merida) and Pauline Ferrand Prevot (Liv Pro XC), with Maja Wloszczowska (Liv Pro XC) and Catharine Pendrel a further five seconds in arrears. By the third lap Pendrel, the winner of the previous round and second in the overall standings, had moved up to join Dahle Flesjaa and Ferrand Prevot in the chase. Pendrel dropped off the pace to eventually finish fourth, while Dahle Flesjaa chased alone after Ferrand Prevot crashed in a rock section and had to briefly stop in the tech zone for assistance. Dahle Flesjaa's gap shrank to 14 seconds by the halfway mark, but that was as close as the Norwegian would get before it stretched out again to 48 seconds at the start of the last lap. Ferrand Prevot dropped Pendrel to take third. Batty had a strong start, but fell off the pace mid-race before recovering in the last lap. Mikaela Kofman (Scott-3Rox) was the only other Canadian woman in the Elite race, finishing 39th. "I went from the beginning and rode the whole race at my own pace," explained Neff. 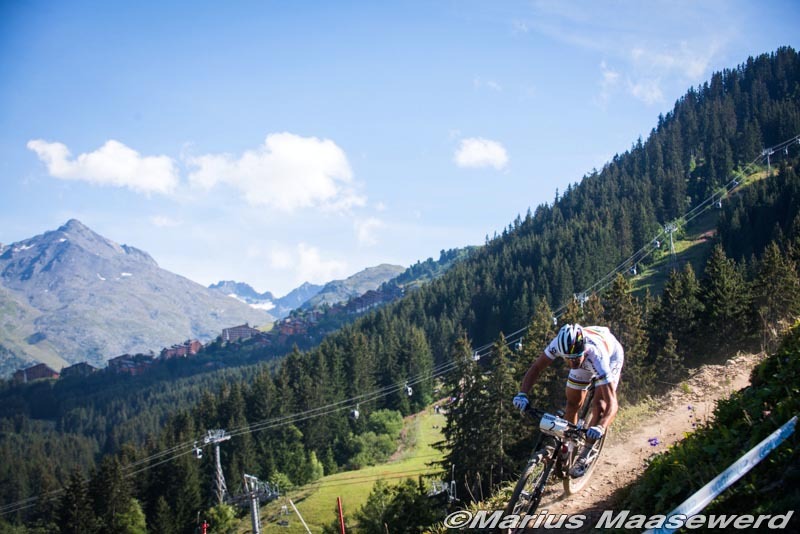 "It is a very nice course, quite technical in the descents and I enjoyed it a lot. The start was especially important here because we didn't have a long start loop and then it went into singletrack, so it was even more important to have a good start then in other races. It was great to win today, even though I didn't need to for the overall. I'm very happy to win the overall trophy." Neff wins the overall title with 1300 points and three wins for the season; the youngest ever World Cup title winner since she is actually an Under-23 aged rider. Pendrel, despite missing the first two rounds due to an early season injury, finishes second with 940 points and Tanja Zakelj (Unior Tools), the defending champion, is third with 856, just ahead of Emily Batty at 830 points. Kofman finishes 31st in the overall standings. In the Under-23 women's race, Helen Grobert (Focus XC) won ahead of Yana Belomoina (Betch.nl Superior Brentjens), who took the overall title after the previous leader, Margot Moschetti (Scott-La Clusaz) finished sixth. Maghalie Rochette (Luna) was the top Canadian finisher in 14th, followed by national champion Frederique Trudel (Canadian National) in 21st and Catherine Fleury (Canadian National) in 25th. The men's World Cup has been dominated by two riders all season - Absalon and Schurter, each with three wins apiece. Absalon was virtually assured the overall title, since Schurter had missed the second round, but it would not affect his desire to win the final round before his compatriots. Schurter is always a fast starter, and had a 20 second lead by the end of the first lap on a chase group initially containing Absalon, Dan McConnell, Mathias Fluckiger (Stockli), Lukas Fluckiger (BMC), Emil Lindgren (Giant Pro XC) and Manuel Fumic (Cannondale Factory). While Absalon was driving the chase on the climbs, with only Fumic able to match him, Schurter was clearly faster on the descents, maintaining a 30 gap at the start of each lap after final long descent. 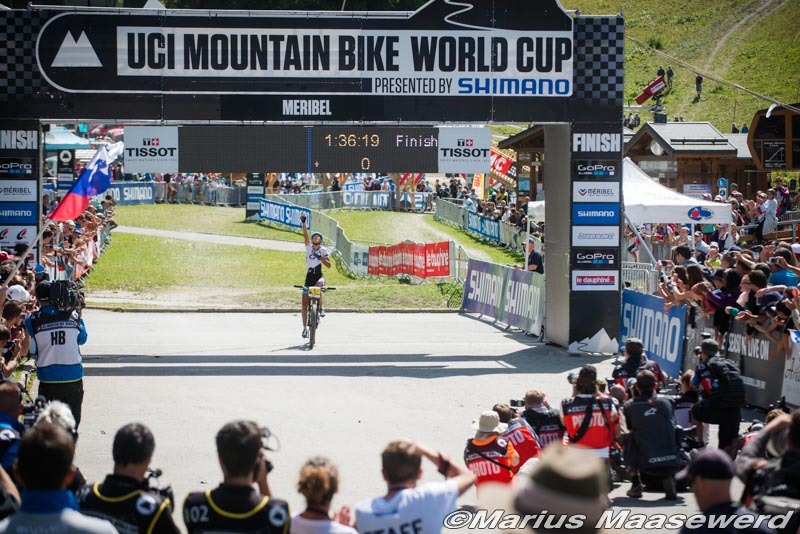 On the final lap, Absalon finally managed to drop Fumic on the climb to solo in 13 seconds behind Schurter, as he took the 14th World Cup win of his career. There were no Canadian men in the Elite race. Absalon wins the World Cup title, the sixth of his career but first since 2009, with 1490 points, followed by Schurter at 1330. McConnell finishes third with 970 points, while Fumic jumps from fifth to fourth with 856 points after finishing third in the final round. Raphael Gagne (Rocky Mountain) drops from 28th to 31st in the final standings after not competing in the final round. Scott-3Rox riders Geoff Kabush and Derek Zandstra finished 36th and 40th, respectively. "I'm really happy to win the title," said Absalon. "I have had it five times, but the last time was a long time ago , so I'm happy to have such a good season. It was really good to have the final here in France with lots of spectators and the ambience all around the track. It was difficult to fight and still do a safe race. For sure it is more pressure for me to race in France; it would be easy for me to do a top-30 to win the [overall] trophy, but in France, for me, it would not be possible to ride in 30th position. For the public I have to fight to be in front. I didn't want to flat, I didn't want to crash or have any technical problem, so I lost lots of time in the downhill. It was a little bit like Windham [Round 6], where Nino was also fast in the downhill." In the Under-23 men's race, Jordan Sarrou (BH-Suntour-KMC) took his fourth win of the season to wrap up the overall title. Canadian champion Leandre Bouchard (Canadian National) was 24th to finish 12th overall, while Jeremy Martin (Canadian National) was 30th (50th overall) and Alexandre Vialle (Canadian National) was 38th (53rd overall). Evan McNeely (Norco Factory) and Mitch Bailey (Trek Canada), who did not attend, were 23rd and 27th, respectively, in the overall standings. - Before the start of each race today, a minute silence was held in memory of Under-23 Dutch rider Annefleur Kalvenhaar, who died yesterday from injuries sustained in a crash during Eliminator qualifying on Friday. There were emotional scenes at the conclusion of both the Under-23 and Elite women's races, which were won by her Focus XC team mate Helen Grobert and friend Jolanda Neff, respectively. Prior to racing, at the manager's meeting the evening before, the UCI left it up to the riders and teams as to whether any racing would take place. Kalvenhaar's team mates said that she would have preferred racing to take place. - Absalon was at a clear disadvantage on the descents, losing upwards of 15 seconds to Schurter (and having Fumic ride back up to him) each lap after gaining roughly 10 seconds on each climb. Absalon was one of the only riders on a hardtail for the rough, rocky course. The question now is whether he will reconsider his decision to not race full suspension until next year, or possibly try it at the Worlds in two weekends? - Gunn-Rita Dahle Flesjaa and Catharine Pendrel have to be considered the two favourites for the Elite women's title now, since Neff and Ferrand Prevot will have to race Under-23 in Norway. Dahle Flesjaa will be going for her fifth Elite title, Pendrel her second. On the men's side, it is, once again, Absalon versus Schurter. Absalon will be going for his fifth Elite title and Schurter his fourth (third consecutive).